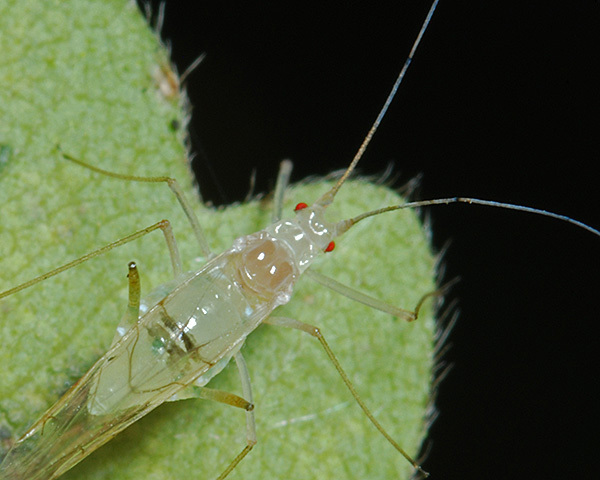 Drepanosiphum are medium-sized to large elongate aphids with antennae longer than the body. They have long tubular siphunculi with a ring-like constriction below the flange. The cauda is knobbed with a distinct constriction. All viviparae are winged. Males are winged and similar to the viviparae except for the genitalia. Oviparae are large and usually apterous, with the abdomen behind the siphunculi extended like an ovipositor. 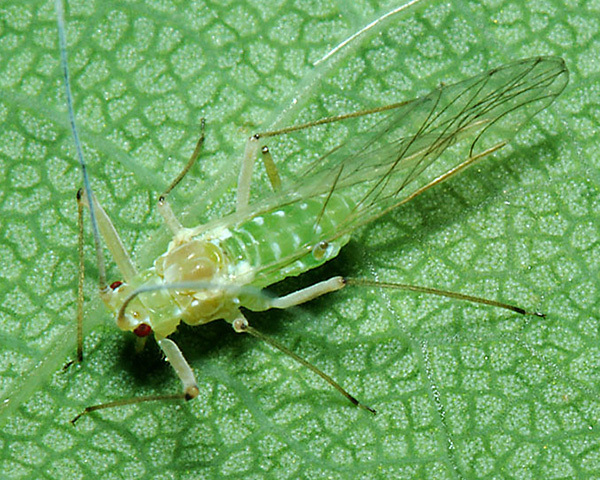 Drepanosiphum is a genus of eight species, all living on the undersides of the leaves of sycamore or maple (Acer sp.). 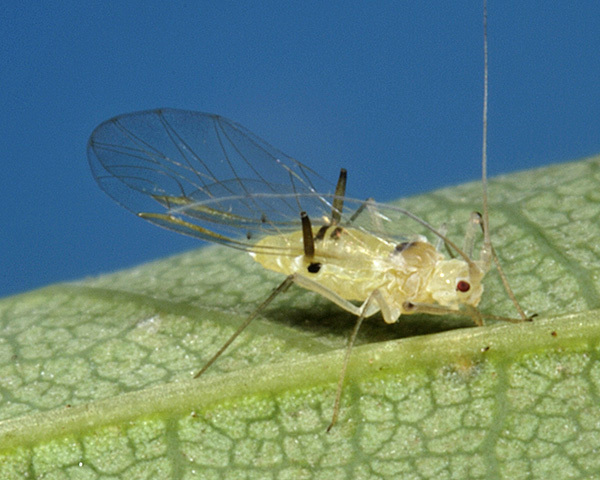 These aphids do not host alternate, but remain on their chosen host species throughout the year. They are not attended by ants. All adult Drepanosiphum acerinum viviparae are alates. These alates are pale whitish-green to chrome yellow, with thoracic lobes darker (see first picture below). The forewings may have dusky spots at the ends of the veins, but the pigment does not extend between the vein endings (cf. Drepanosiphum aceris which has a dusky patch at the end of the forewing). There are often one or two short brown bars on abdominal tergites 4-5 only (cf. Drepanosiphum platanoidis which never has black bands across abdominal tergites 4-5 only), and usually a conspicuous brown-black spot in front of the base of each siphunculus (see second picture below). The siphunculi are only slightly swollen, and are either entirely or distally dark or black. The long antennae are pale but the segments have brownish tips. 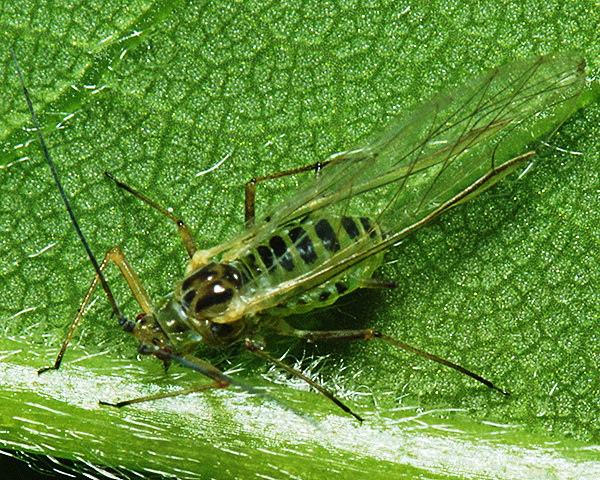 The body length of an adult Drepanosiphum acerinum is 2.1- 3.3 mm. Drepanosiphum acerinum aphids live on sycamore (Acer pseudoplatanus) saplings in the shade. Sexual forms occur in September-October. The species is found throughout Europe, except the Baltic region. All Drepanosiphum aceris viviparae are alate. Adult females are yellowish or pale whitish-green with dark thoracic lobes. The forewing has a dusky cloud on membrane at wing apex between terminations of veins Rs and M1 (see first picture below) (cf. Drepanosiphum dixoni, which never has a dusky apical cloud on the forewing membrane) and another (less clear) at the outer end of the pterostigma. There are often rather narrow cross-bands on abdominal tergites 4 and 5 (see second picture below) (cf. Drepanosiphum platanoidis which never has black bands across abdominal tergites 4-5 only). Drepanosiphum aceris also usually have lateral spots in front of their siphuncular bases. The siphunculi are dusky (not black) at least distally. The body length is 2.7-4.2 mm. All adult Drepanosiphum platanoidis viviparae are alates. The alate female Drepanosiphum platanoidis has a yellow-brown head and thorax with darker brown markings. The abdomen is pale green. 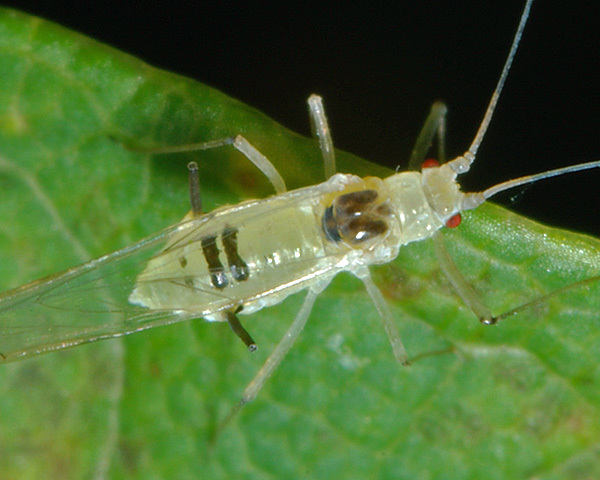 If the alate develops in spring or autumn, it has variably developed dark cross-bars (see first picture below), but if it develops in mid summer, there are no cross-bands and the aphid is generally paler (see second picture below). The dark cross-bars are never restricted to abdominal tergites 4-5 (cf. Drepanosiphum acerinum which has one or two short brown bars on abdominal tergites 4-5 only). The antennae are brown, and the siphunculi are pale with a brown tip. The forewing has no black spot at the tip nor one at the outer end of the pterostigma; the pterostigma is defined by two longitudinal brown stripes. The body length is 3.2-4.3 mm. Note: Drepanosiphum platanoides is an incorrect, but commonly used, synonym for Drepanosiphum platanoidis. 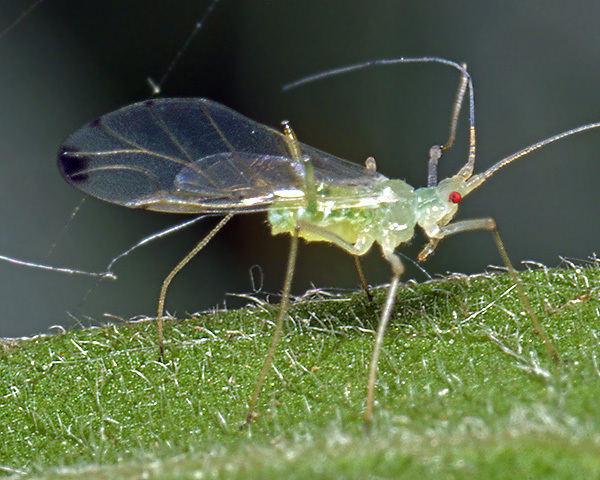 The common sycamore aphid is found on the undersides of leaves of Sycamore (Acer pseudoplatanus). It is also recorded from many other Acer species, as well as a wide variety of other trees which are only visited on a casual basis. Sexual forms occur in September-November. Drepanosiphum platanoidis is common or abundant on sycamores wherever they are grown in Europe, central Asia, north Africa, Australia, New Zealand, USA and Canada. Heie, O.E. (1982) The Aphidoidea of Fennoscandia and Denmark. II. Drepanosiphidae. Fauna entomologica scandinavica 11, 176 pp. Stroyan, H.L.G. (1977). Homoptera: Aphidoidea (Part) - Chaitophoridae and Callaphidae. Handbooks for the identification of British insects. 2 (4a) Royal Entomological Society of London.